Industrial 3D printing is at a tipping point and is about to go mainstream in a big way. It has been predicted that the industry will go through revolutionary changes when 3D printing becomes more widespread and by publishing this research we aim to accelerate this revolution. Technology has moved well beyond prototyping, rapid tooling, trinkets and toys; additive manufacturing is creating durable and safe products for sale to real customers in moderate to large quantities, thereby creating economies of scale. Point to ponder:How fast this will happen? The U.S. hearing aid industry converted to 100% additive manufacturing in less than 500 days, according to one CEO and not a single company that held on to traditional manufacturing survived. Although it is hard to imagine that this technology will replace the traditional ways of manufacturing, the recent advances in this sector suggest an imminent, drastic shift in the industrial landscape. The automotive industry has become an aggressive target for the development of new 3D printing techniques. Key industry players which include but is not limited to Daimler, Bayerische Motoren Werke (BMW), Ford Motors, Volkswagen, Continental, General Motors, Robert Bosch and Mazda Motors have done significant patents filings in this technology domain. The majority of innovations for 3D printing in the automotive industry have originated from the Germany, China and United States; with Germanybeing the leading country in research. 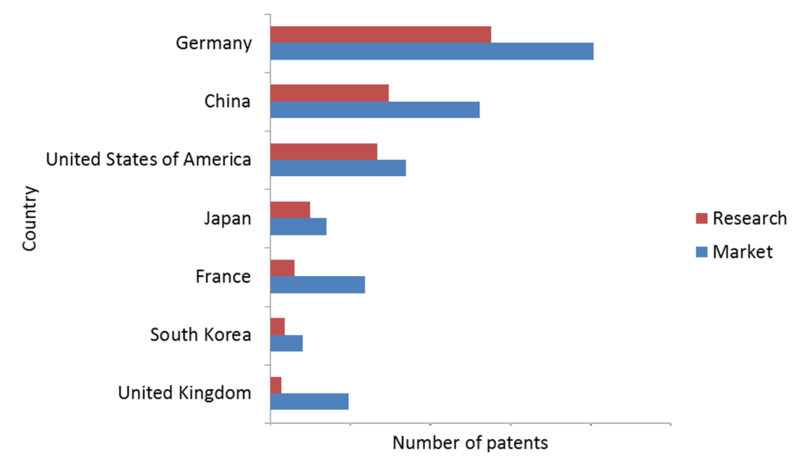 The primary focus of German researchers seems to be Selective Laser Melting technology with majority of the patents being filed after 2012 in this technology. 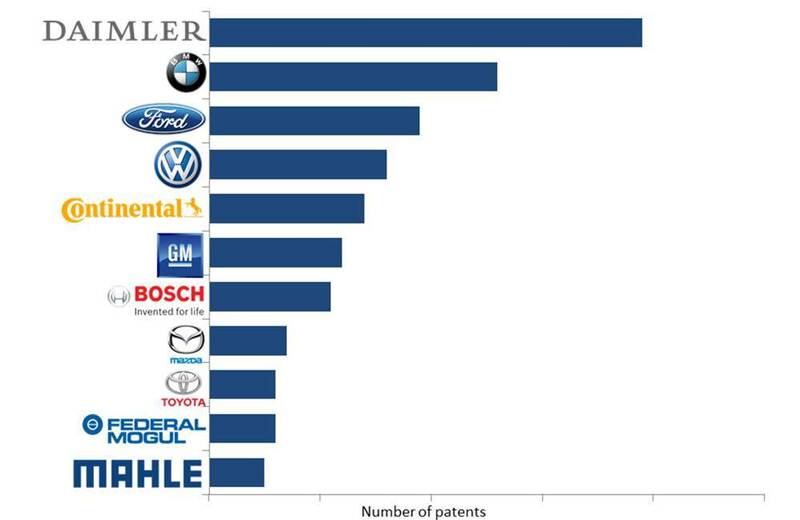 From Germany, BMW has filed most number of patents in SLM this technology, followed by Daimler. Majority of the patents filed in power unit technologies focuses on manufacture of engine components and exhaust systems.Robert Bosch and Daimler have filed patents that mainly focus on manufacturing of Power unit components. Particularly, Robert Bosch is focused primarily in manufacturing of fuel supply systems whereas Daimler is focused in manufacturing of engine and turbocharger components. Daimler seems to be relying more on polymer such as polyamide, polyurethane (PUR) etc., followed by metal alloys (in, particular) iron-based metal alloys. Polyamide polymer was mainly focused in between the years 2007-2016 and was disclosed in significant patents filed by Daimler in that period. Iron based alloys were mainly focused between the years of 2015 and 2017. Reducing cost and time of manufacturing is the primary focus of Daimler. Volkswagen has started to manufacture various manufacturing aids including various types of gauges, jig and badges. It primarilyfocuses on polymers material and secondarily focuses on metals. Aluminium, Aluminium alloy and Magnesium are the major focused upon materials from 2014 onwards. Recently, China has also seen the most increment in patent filing in recent years with Stereolithography being the mostly focused technology and polymers being the mostly focused upon material. There are several new entrants in the automotive industry that has filed significant number of patents in 3D printing technology. One being Mazda Motors,a Japanese multinational automaker, started leveraging 3D printing technology with its focus in manufacturing of transmission parts followed by manufacturing of valves of a hydraulic device. Other important industry player like Federal mogul has used 3D printing methods mainly to manufacture piston and pistons parts that face problems such as high mechanical load, use of expensive materials in order to get desired characteristics and complex tooling. In doing so, its primary concern seems to be improving the automobile part/component efficiency and reduction in their manufacturing cost. Michelin seems to be focused only on the Powder Bed Fusion techniques. It is utilizing these techniques especially for the tool making purpose such as lining blade for tire mold, tread molding element for a tire, and mold for making vehicle tyre. Among the materials, use of titanium, aluminium and steel has increased dramatically after 2011 primarily for manufacturing of automobile body/frame parts. Until now, 3D printing has been realized best suitable for manufacturing serial parts and customization. Ease in constructing any desired geometry, single step manufacturing without requiring extensive assembly operations are important key features of 3D printing that made it easier for design engineers to make parts with desired properties and functions that were previously restricted by the constraints of conventional production processes. Also, the potential to integrate technologies like reverse engineering helps in designing models of its competitors’ vehicle parts/components. Such features of 3D printing enable the competitors in automotive industry to gain competitive advancements. Also, with the increase in level of penetration it seems to be that, soon, organizations will look forward to utilize 3D printing system for mass manufacturing of relatively small and special parts and that can help them cutting down time and cost for lower volume, specialty or customized items. To define, describe, and project the 3D printing for automobile based on application, material, production methods used in 3D printing, scanning and modelling techniques, technical challenges faced and regions of interest (research and market areas- country wise analysis). To analyze the opportunities offered by 3D printing technology in various segments of automobile industry. To identify key disruptions (their impact and their current state analysis), mega trends predictions and considerations for the future, recommendations for starting new research/ development programs in 3D printing in automobile (including recommendations on acquisition/ collaborations/ licensing). This report is a Handbook of Innovations & Technologies (HIT), in the domain of 3D printing in the automotive industry and provides insights into the technical challenges, existing solutions, innovation trends, market trends and key participants in the innovation ecosystem. This report is essential reading for everyone associated with the domain of 3D printing, providing clear answers to problems and issues faced, enabling them to take key decisions. For example, this report can be beneficial to CEOs, heads and members of R&D departments, heads and members of IP/strategy departments, heads and members of HR departments, heads and members of marketing departments, academic researchers and scientists, patent agents and/or attorneys, as well as investors and consultants operating in the domain of both the 3D printing and automotive industries. Which specific materials are used for 3D printing in the automobile industry? What are the major IP stumbling blocks (dark spaces) in 3D printing in Automobile domain? What patenting strategies are being adopted by major players in 3D printing in Automobile domain (jurisdictions, type of claims, patent maintenance, etc.)? What are the major law firms/agents involved in 3D printing in Automobile domain? To prepare this report, multiple diverse searches were conducted to comprehensively identify all the patents pertinent to 3D printing in the automotive industry. These patents were then analyzed manually to capture their focus and application areas and identify the technical challenges. Thereafter, informative and actionable insights were generated by combining this manual information with the bibliographic information of the patents. Expert industry analysis has also been included as part of the research. Table 9 - Top art units in the U.S.